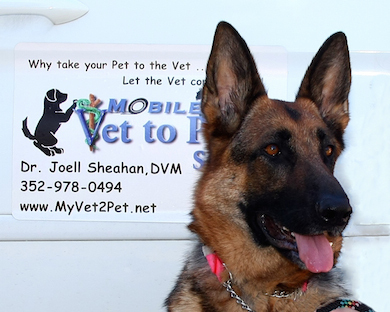 Why Use A Mobile Veterinarian? You can schedule appointments on your schedule, before or after work, evenings and weekends. House calls spare pets that do not travel well from the experience of a car trip. Large pets or those with arthritis or those with advanced age may be difficult to transport. This service offers an option. Owners with multiple pets do not have to make several trips to a veterinary clinic for routine care. A single house call can treat all your pets. People with several pets may need to make multiple trips to the hospitals for routine care. Owners who find it difficult to drive or may not have any transportation will find this a convenient and valuable alternative to hiring transport to take your pet to a clinic. Exams are done in your home, in your pets accustomed environment where chronic conditions are best observed. It avoids situations where aggressive pets are exposed to other pets at the veterinary clinic. It avoids exposure to contagious diseases when visiting clinics for annual exams.